In the United States, I am used to relatively polished church services. The music leader especially has the responsibility to make the transitions smooth, the volume balanced, the welcome cheerful. It is that person’s responsibility to keep the engine moving without a hitch. If something does “go wrong”—that is, if things aren’t just perfect—then there are all sorts of discussions in planning meetings about how to avoid such mistakes in the future. My first Sunday at church in Cambodia, the music leader got a phone call right in the middle of a song. He stepped outside to answer the call, and everybody else just kept singing. When he finished the call a minute later, he stepped back in front of us and kept singing like nothing had happened. Needless to say, church looks a bit different in Cambodia than in the US. 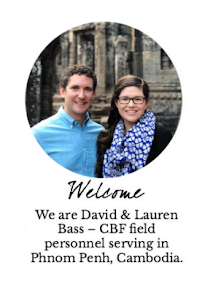 Lauren and I are committed to attending a Cambodian church while we live here, but it’s not always easy. First and most obviously, the language barrier makes this difficult. We understand so little of what is said that it is hard to feel like I am “being fed” much. On a related note, not being able to read Khmer means that we cannot follow along in the songbook. I rarely get the opportunity to sing along in church. Now that I have learned the basics of reading, I can catch a few words here and there, but I’m definitely not able to sing along with everything. My usual strategy is to look ahead to the long held-out note at the end of the phrase and sing that syllable along with everybody else. Then there are the relationships. Several people have been very kind and welcoming to us, but the language barrier keeps our conversation at a fairly basic level. We test the patience of even those who are most eager to get to know us. 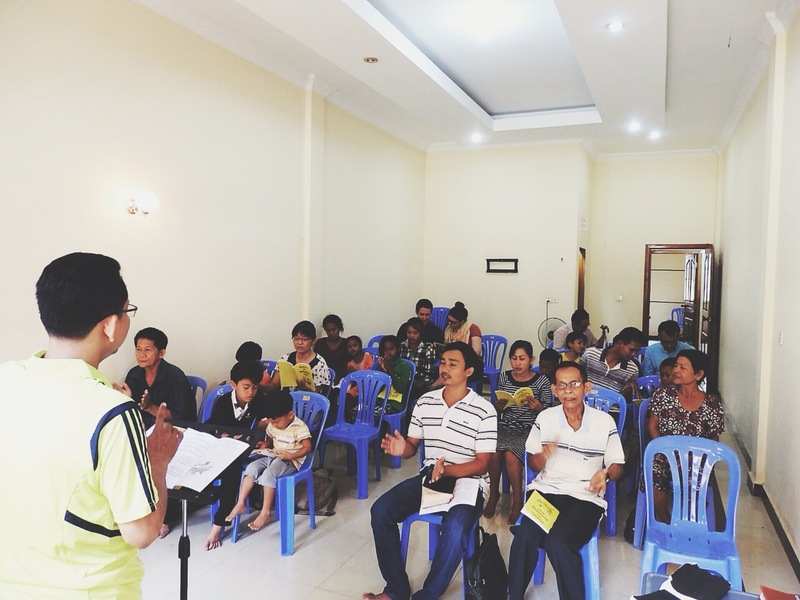 Church in Cambodia is not always a particularly gratifying experience. My church attendance is not based on happy feelings. My church attendance is based on my belief in the church as the bride of Christ and the main instrument we have here on this earth for participating in God’s kingdom. I have believed this for a long time, but never has my belief been put to the test quite like this. Now that the feelings have been stripped away (for the time being, at least), I have nothing but my belief that the church truly is on the front lines of what God is doing in the world and that even when I don’t understand 90% of what’s going on, I would be missing out on something powerful if I stayed home. I believe now more than ever that our true beliefs about the church are put on display when it becomes difficult to go to church. Everyone’s situation is different, and there are instances in which it is appropriate to switch to another church. But when I think of those who live in countries where there is not a church on every corner and the sacrifices they must make to worship with other believers, it changes my perspective. I confess that I am becoming less patient with the consumerism culture that says the church must meet all my needs or I’ll go find another one (or stop going altogether). As it turns out, the doors on the ground floor of our church building in Phnom Penh have to be locked for security reasons when everybody heads upstairs for the church service. The music leader is the person you call if you arrive after the doors have been locked, and he will send someone to let you in. This is why he answered his phone right in the middle of a song my first Sunday at church. The first time I saw him do this, I thought the action was a bit quirky, if not rude. However, when seen through the realities of having church in this city and in this culture, it was an act of welcoming. Every time he receives a phone call in the middle of worship, it means that one more person has made the journey and the sacrifice to participate in the body of Christ that week. This example of answering the phone is one small way in which I have learned something new since I’ve committed to being a part of this church for the long-haul. I trust it will be the first of many things I learn about church, God, myself and Cambodia as I stick with this often difficult, always humbling body we call the church.